Designing a roof made of a natural product, one that lasts more than just a couple of years, has been a challenge for me. Luckily, as sometimes happens in this amazing universe of ours, other people have obviously had the same challenge and suddenly there appeared on the internet and via friends, information on roofs made of bamboo tiles. I had a good look all over the web, and friends sent me photos. I went to visit places with bamboo tiled roofs. Each roof had similarities and differences and eventually I came up with my own design. One of my challenges was that I wanted to retain a dome-like shape. 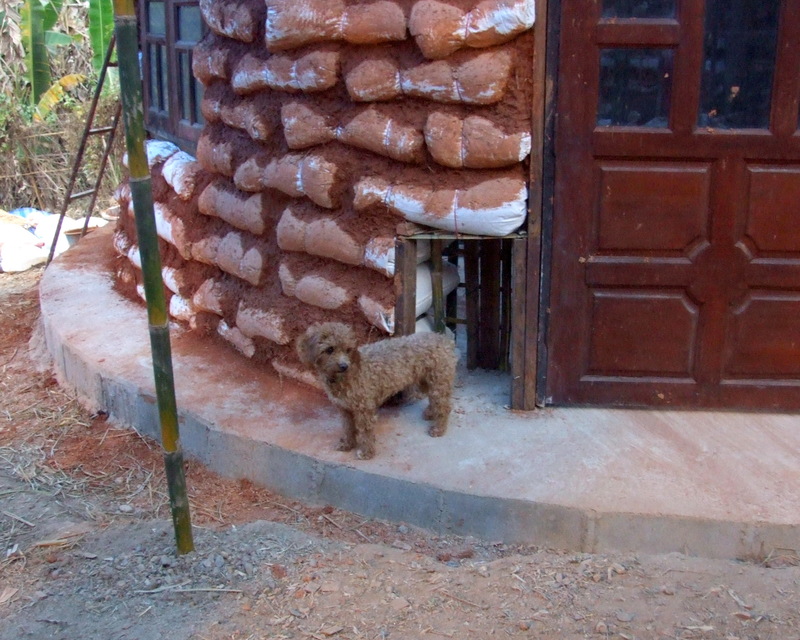 I already had a dome of bags of rice husks covered with cob and finished with a lime plaster. So my first step was to make the framework on which the bamboo tiles could be attached. I cut down bamboo for the ribs and split it in half, as I wanted to have a gentle curve, and although I have tried different methods of bending whole pieces of bamboo, I have not found one that is appropriate for my needs. However, splitting bamboo in half works perfectly! I also bought sheets/panels of already split bamboo. This kind of split opens up the whole piece of bamboo making it flat. These are available very reasonably priced in different sized panels. We cut these panels into lengths of 70 centimetres. Then all the bamboo was put to soak in a borax solution for at least a week. 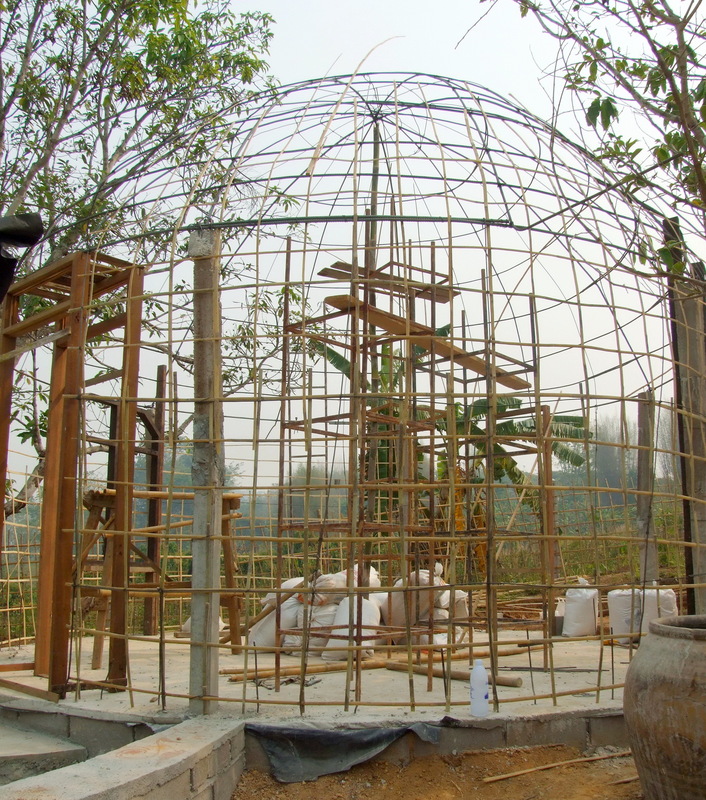 The bamboo frame needed to be attached at the top and the bottom of the dome somehow. 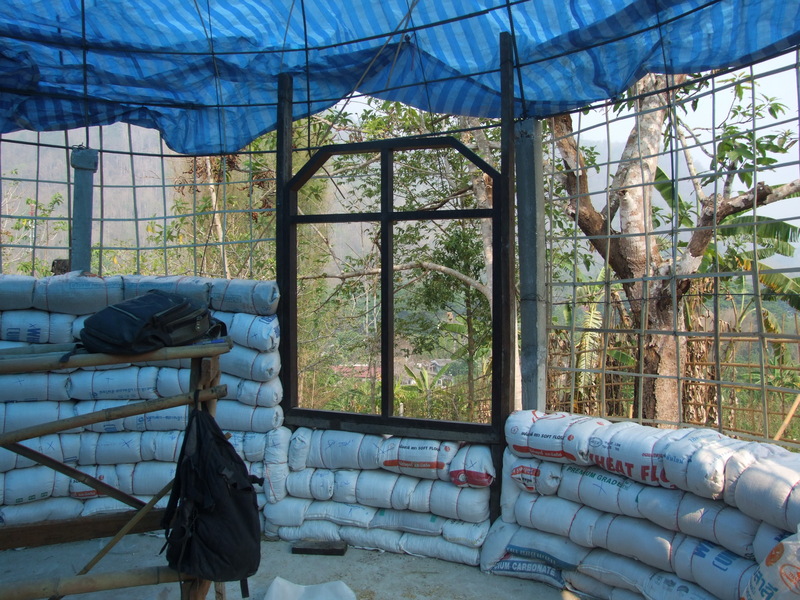 There was no question of nailing the frame to the top as it was just bags of rice husks and cob. So we put a metal motorbike tire rim on a bed of old motorbike tires at the top of the dome. 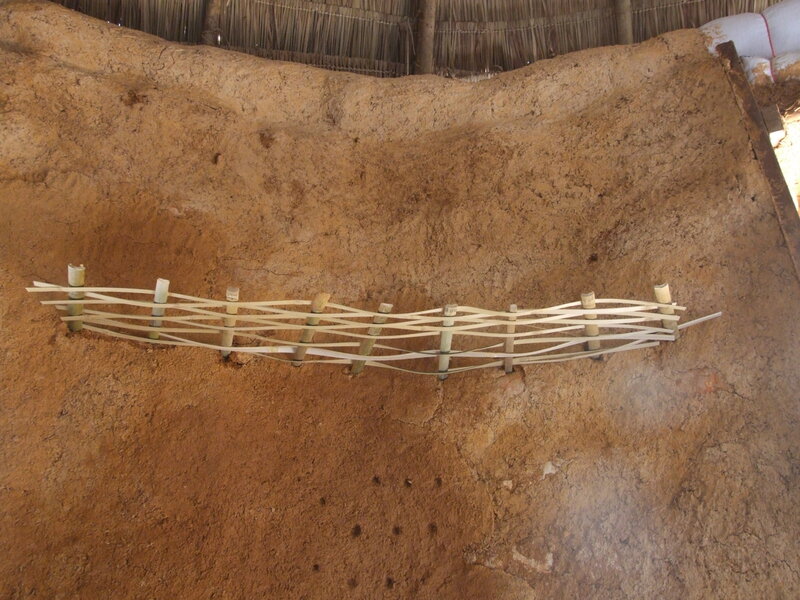 Long strips of bamboo were then attached to the rim with wire (lots of useful holes in the rim!). Wooden brace from wooden building posts extended to attach the rebar on which the bottom layer of bamboo tiles sits. I had already done a bit of planning for the roof, without knowing what it was going to be made of, when the building first went up, and had attached a wooden brace to the top of each of the 6 wooden posts of the building. However, I now realised this brace did not stick out enough, as I wanted there to be a gap between the limed roof and the bamboo tiles. So we added extra wood coming out from the top of the brace. Rebar was then bent to fit all around the dome and attached to the end of the braces, making a circular rim on which to attach the ends of the bamboo coming down from the top of the dome. 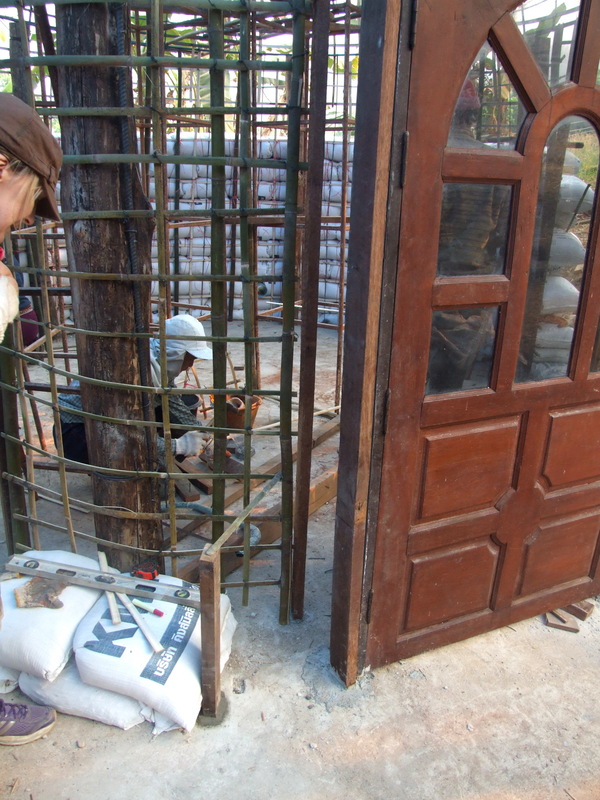 Our vertical bamboo ribs were about 70 centimetres apart when they were attached to the rebar. More ribs were then fixed horizontally covering the whole dome, 35 centimetres apart. We bought an electric tool! It is the first one we have used on our buildings, but attaching hundreds of bamboo panels without a nail gun was not an option! Each bamboo panel had a thin piece of bamboo at the top, and this was hooked over the horizontal rib and nailed on. Several nails went into the top part of the panel, which would not be a problem as it would be covered by the next panel on top. 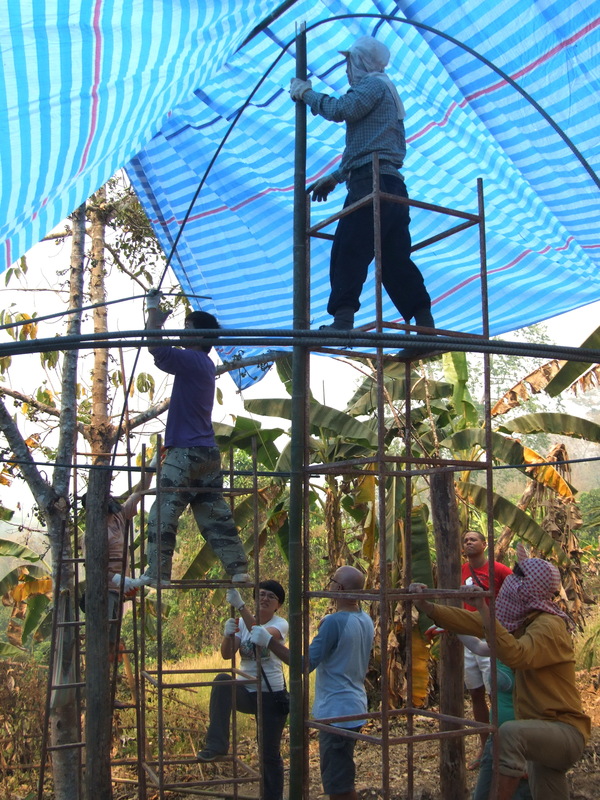 Thus, one 70 cm panel was overlapped 35 cm by the next panel creating a double layer of bamboo roof. Right at the top we needed something to fit over the rather untidy junction of the bamboo ribs to make it look good and keep the rain water out. Using bamboo and chicken wire we created a top-knot which was then covered in EPScrete, which is a fancy name for a concrete and styrofoam mix. This makes a very light-weight concrete, enabling us to build quite a large mini dome and still lift it up on to the domed roof by hand. A mosaic finished off the top-knot and a bell hanging from the centre gives a lovely sound in the wind. When we were creating the bell, it did not move enough in the wind, so I attached an old credit card to the bottom and now it moves very well! Having a space between the cob dome and the bamboo tile will give the roof extra insulation, so I am expecting this to be a super cool roundhouse during the hot weather, and hopefully warm during our cold season too. Hot weather is coming up, so I will be trying that out first! 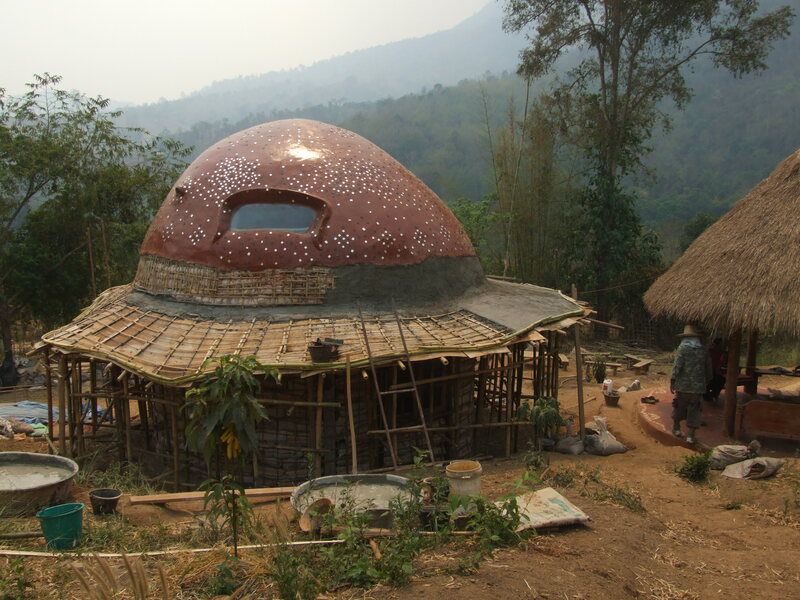 In the above picture you can see the gap between the bamboo tiles and the plastered roof – and a skylight made from an old car window that matches a similar hole in the dome to let light into the roundhouse. Anyone out there trying this kind of roof, let me know if you need any more details, or just encouragement to experiment – I would be happy to help! This is an article published in the latest Owner Builder Magazine. 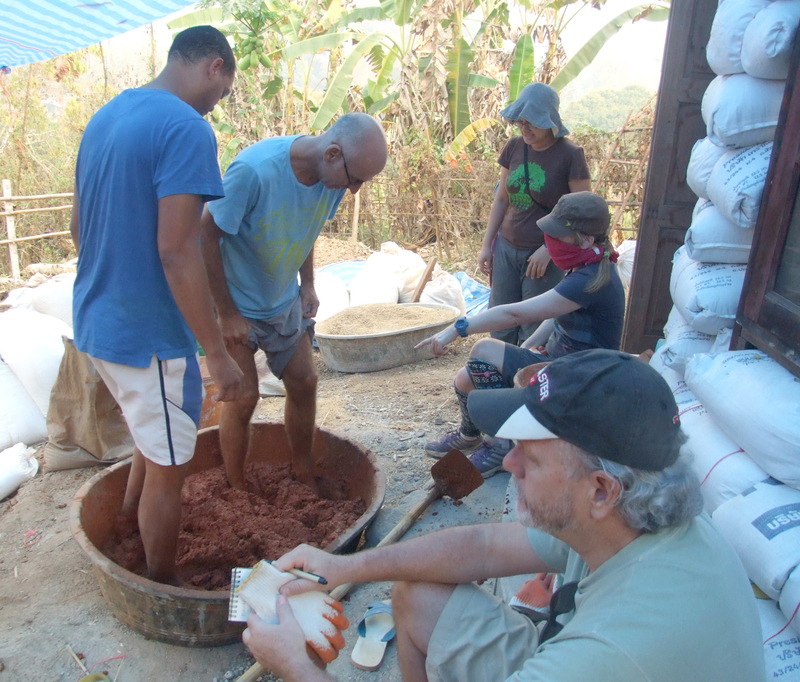 It is all about the experience of being at a workshop at Chiang Dao Roundhouses and learning how to build using rice husks (hulls). The Owner Builder Magazine, published in Australia, is a great resource for wannabe owner builders as well as those currently building their own unique homes. If you are looking for info on our November 2015 Workshop, click on the last Blog post ‘Building a Women’s Workstation – Workshop November 2015’ from the menu on the right. Picture of the cover of the latest edition, which has our article in it. 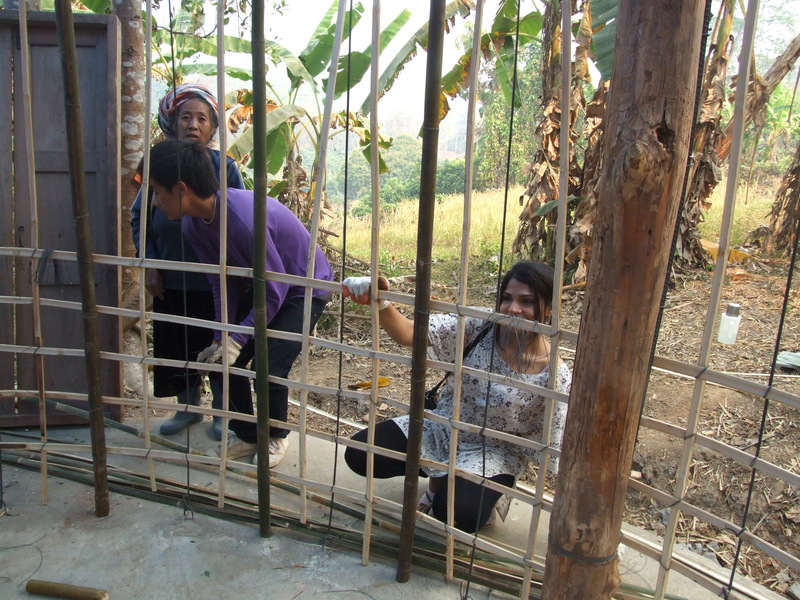 We will be building a workstation for the women of the Nwai Pan (Every Fresh Flowers) Group. These women are Kachin, an ethnic group originally from the mountains of northern Burma (Myanmar). 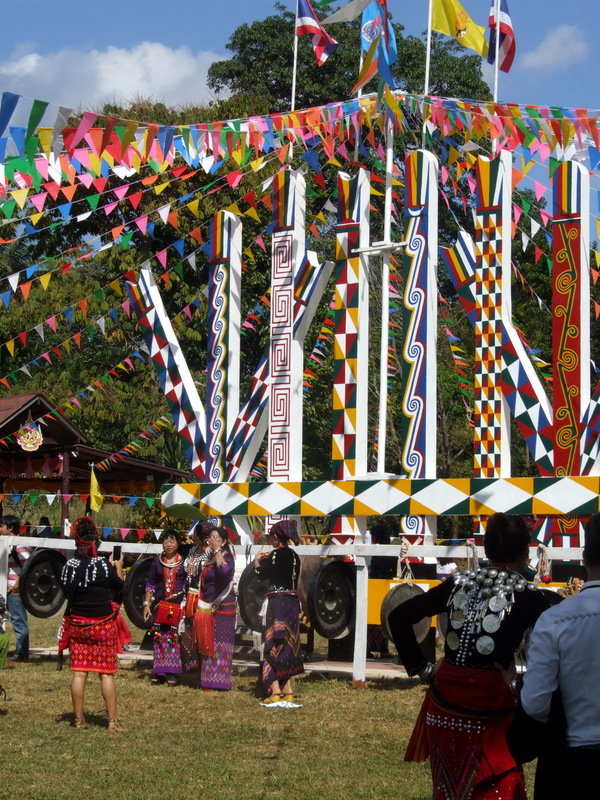 Totem poles are unique to the Kachin culture in South East Asia. As an ethnic minority, the Kachin in Burma have experienced persecution over many years and a number of them fled to Thailand looking for a safe place to live. Thirty years ago, His Majesty the King of Thailand granted them some land on which to settle. This is the site of the village, Ban Samarkee, where we are holding our workshop. 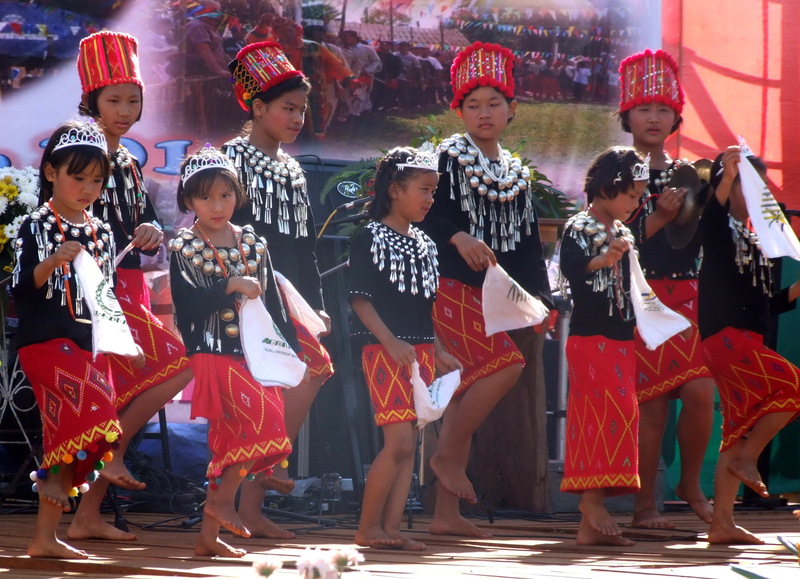 Young Kachin girls in ceremonial dress dance at a festival. Unfortunately people in the village are struggling to overcome poverty caused in part by lack of water for six months of the year when there is no rain to irrigate their fields, and a reliance on genetically modified (GMO) seeds, and their attendant and expensive chemical fertilisers and pesticides. 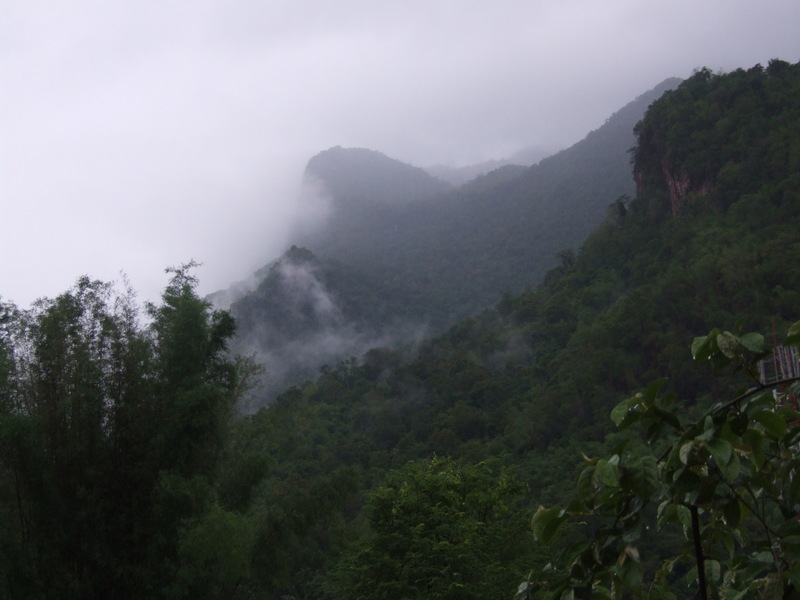 In 2014 the Nwai Pan Group initiated The Land with Life Project with the support of the Galaxy Republic, a foundation based in Holland. The aims of the Project are to improve the life and health and increase the income of the women of the Nwai Pan Group. The Group are planning to move into food processing for the first time. They have decided to make peanut butter, as peanuts are often grown in the village fields. They are hoping that this new venture will help them to break the cycle of poverty, as well as provide an example for others in the village. The Group decided that they wanted an eco friendly workstation for their peanut butter production and invited me to run a workshop to build them a workstation. Vocational students from Swinburne University of Technology, Melbourne, Australia will be raising money for the project and for the food processing machinery as part of their event management course. With their help and the help of the Galaxy Foundation, we hope to give these women a firm foundation on which to build a sustainable project. Not only will the workshop be building for a great project, but it will also be a unique chance to learn how to build using bags of rice husks (hulls). 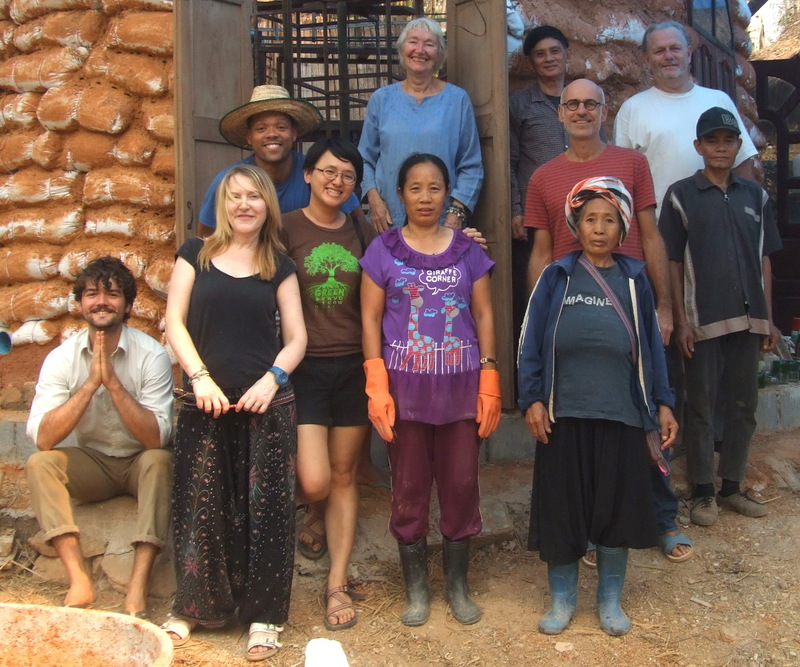 I will facilitate the workshop, having had the experience of building with rice husks continuously for the past 3 years (see www.chiangdao-roundhouse.com for pictures of rice husk buildings). 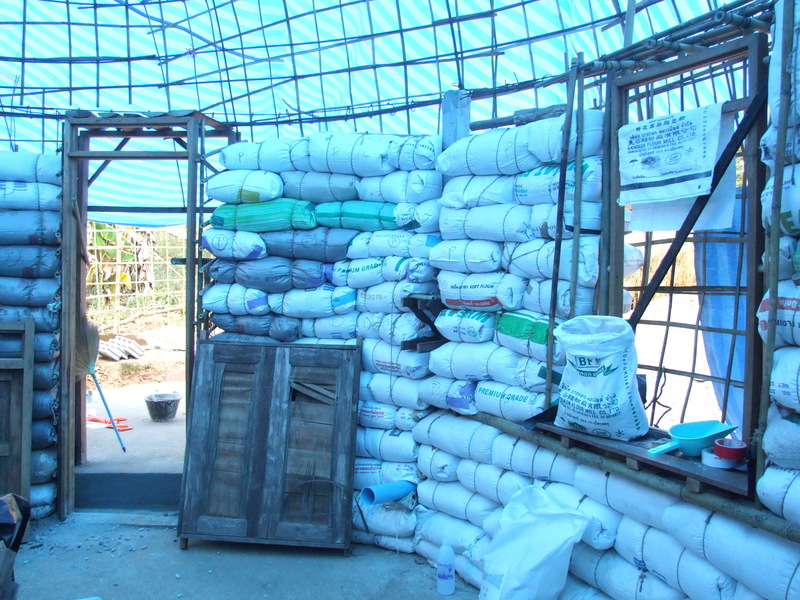 Bags of rice husks form the walls – the amazing colour comes from the blue tarpaulin protecting us from the heat of the sun. 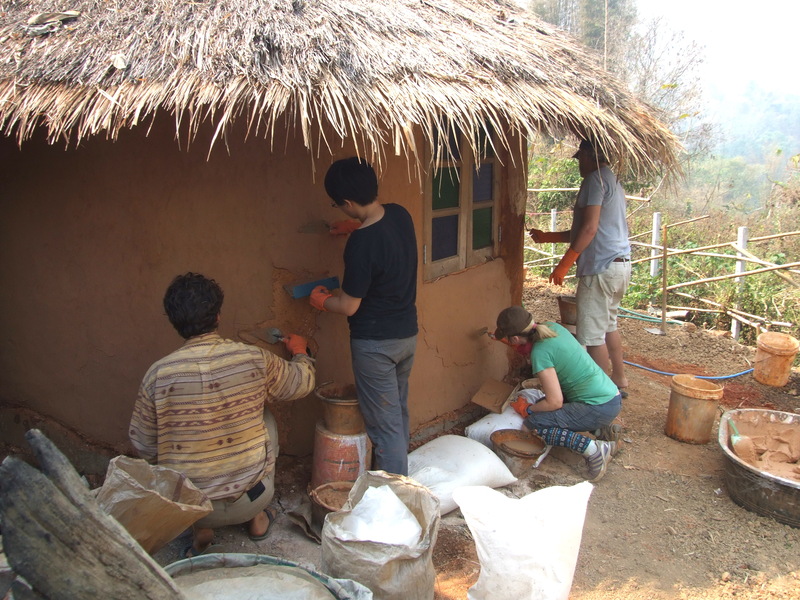 We will learn how to build the walls of rice husks and put in windows and doors. Next we will learn how to mix and apply plaster made from earth, sand, lime and rice husks. 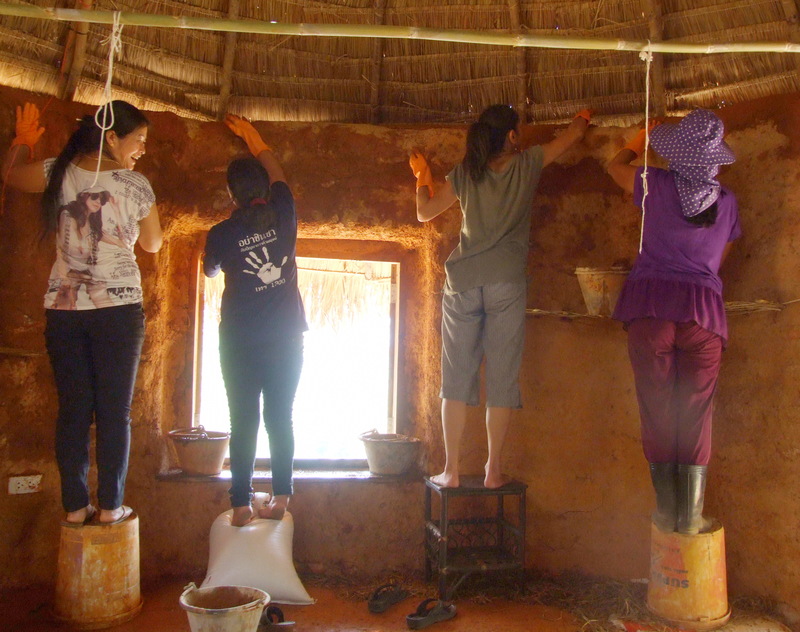 Women from the Nwai Pan Group visit Chiang Dao Roundhouses and have a go at plastering with mud. We will also learn how to make an earthbag bench, and using woven bamboo, make sturdy shelves. 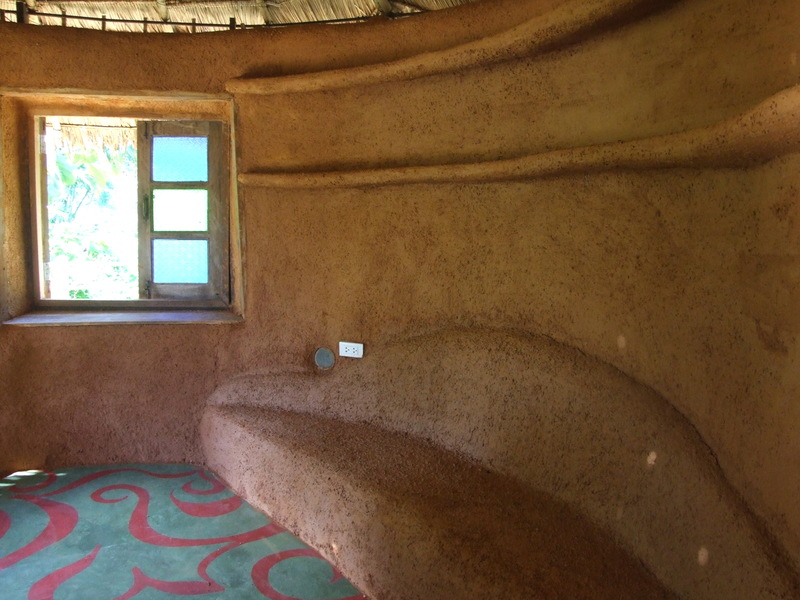 Bench made of earthbags, and shelves of bamboo, both covered with earth plaster. In addition, we will learn how to decorate our walls with bottles. Burning string cuts the bottoms off the bottles. 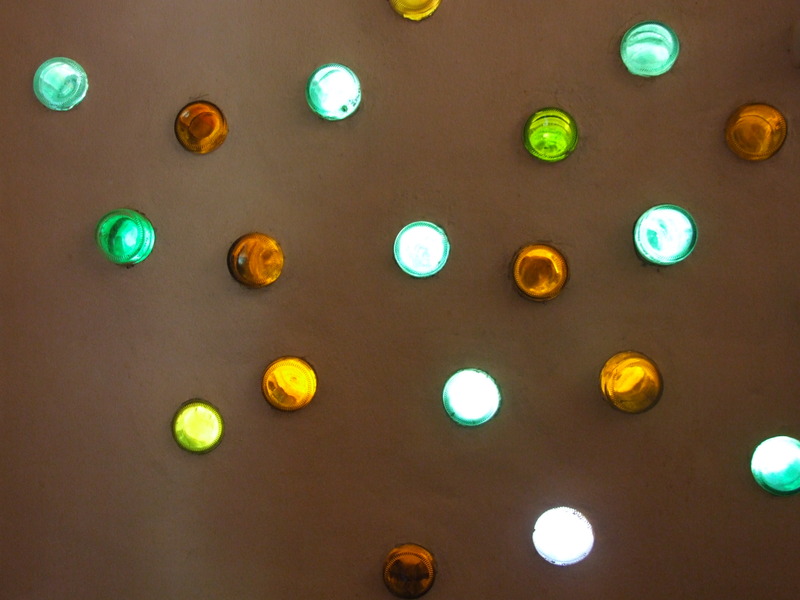 Coloured light filters into the room from this bottle design in a wall. The workshop will start on 3rd November (arrival of participants 2nd November) and end on 13th November. Cost for the workshop will be I0,000 Baht. A non-refundable deposit of 2000 Baht will confirm your place on the workshop. The balance is due 2 weeks before the start of the workshop. If you are interested in becoming part of this project, but are not able to attend the workshop, contact Noriko Yabata at the Galaxy Republic Foundation noriko@galaxyrepublic.net There are many ways in which people all over the world can help support this worthwhile endeavour. 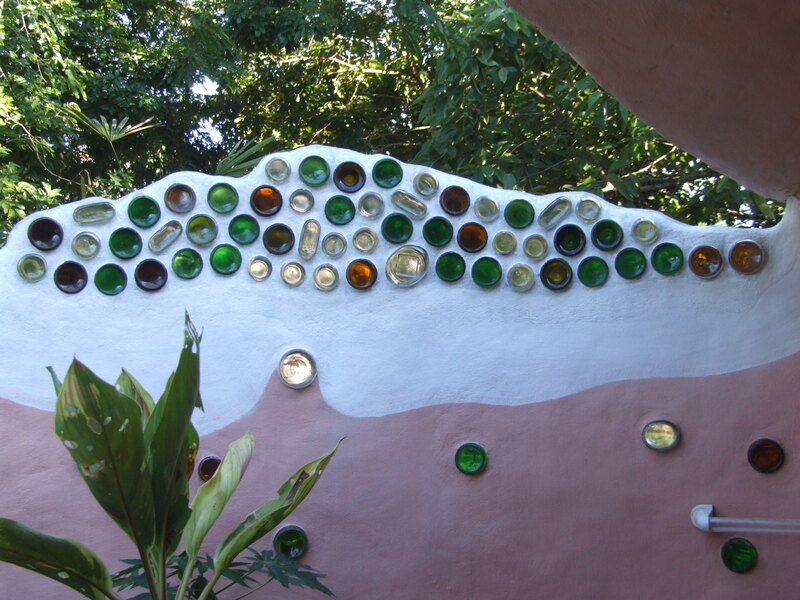 Bottle design on an outside wall. Clearing the area for the new Roundhouse Dome. We prepare the area and the foundation before the workshop participants arrive. The area planned for the new Roundhouse Dome is tucked in the north west corner of the property and we are going to have to take down this jungle ficus tree to make room for it. There are many of these trees that grew up spontaneously on the property. Unfortunately the fruit is not edible for humans, birds or animals and the wood is very soft and breaks easily. As you can tell, I am trying to justify cutting down a tree! Using a spirit level to check the height of the wooden posts. With the tree gone (leaves to compost, branches to the edges of the property to form swales to trap rainwater run off), there is now enough space to prepare the foundation. The top soil is moved off, and the ground levelled which includes cutting into the sloping hill. Then the posts that will hold up the roof go in. These are hard wood posts, and they will be visible inside the finished building. Volunteer Eric making sure that the outer edge of the foundation is the right distance from the outer wall of the roundhouse, and a centimetre lower to enable water run off. We are going to do something a little different and continue the concrete base out from the edge of the building so that any rain splashing from the roof will drain away easily. This means that the outside 70 centimeters of the base will need to slope down a centimeter. Thus the concrete base will not only protect us from voracious termites, but also from the rain which can soften the earth around the building causing the building to move, and crack. Final layer of cement is laid on the foundation the day before the participants arrive! 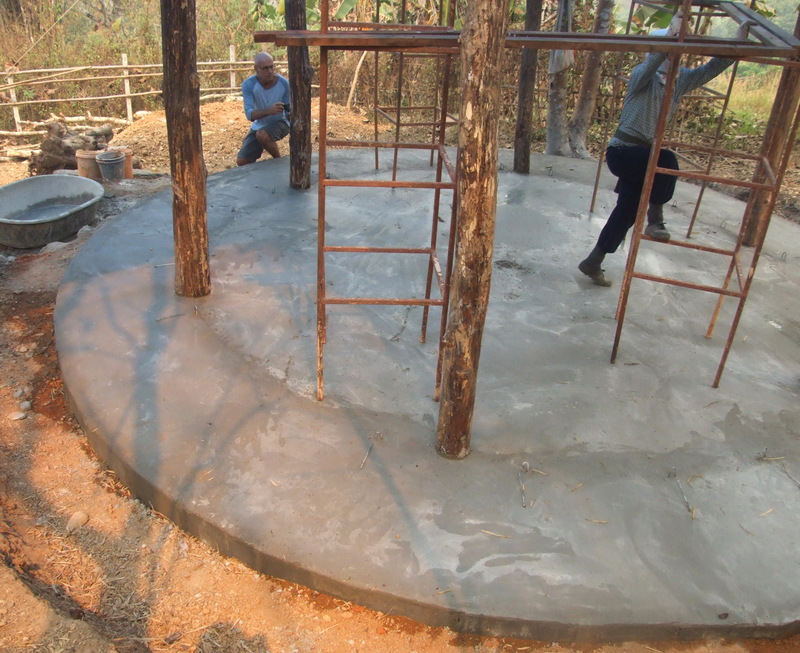 There was a village temple fair the week before the workshop and all the workers disappeared leaving just two or three of us to panic and amazingly manage to get the foundation finished literally the day before the participants arrived! We were still curing the cement as the building began, washing it down with water early morning and in the evening after we had finished working. The most important 3 pieces of rebar go up forming the height and shape of the dome. The height and shape of the dome is created with 3 strong pieces of rebar (reinforced steel) going across from post to post. 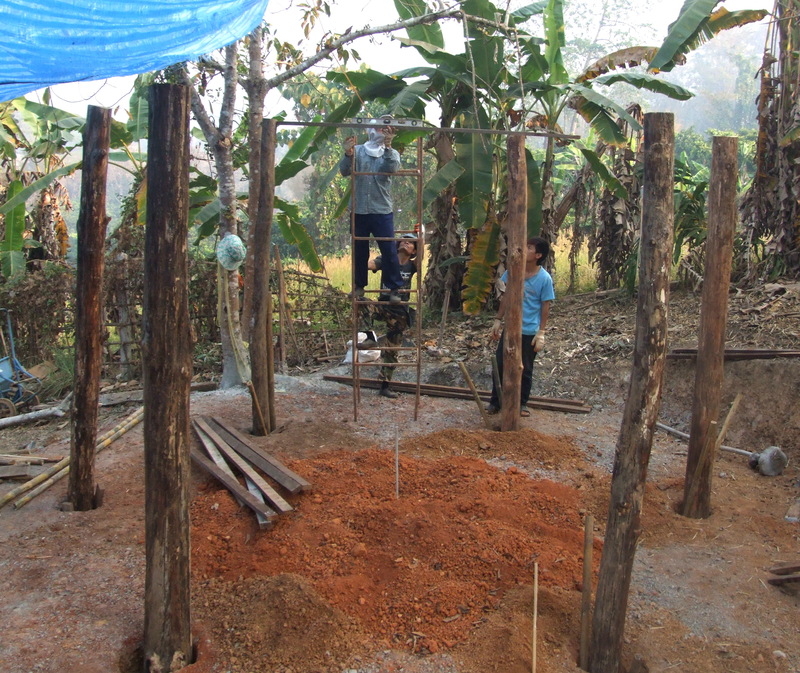 Once we have the placement where we want, the rebar is attached to the wooden posts and we begin to weave the lighter rebar and bamboo to form the frame on which to attach the bags of rice husks. Working on the bamboo frame for the walls. 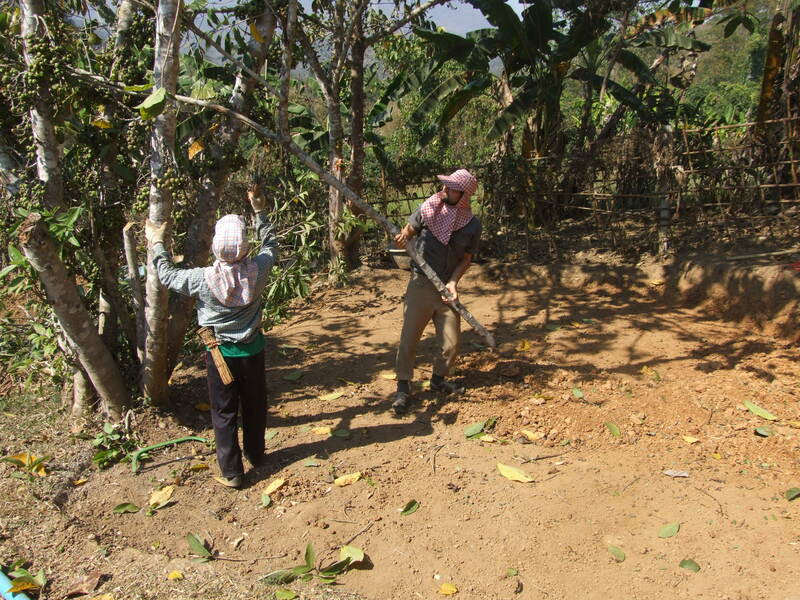 Everyone had a go at cutting and harvesting the bamboo from a neighbour’s field. Then the bamboo needed to be cleaned and split. Good practice for using machetes! 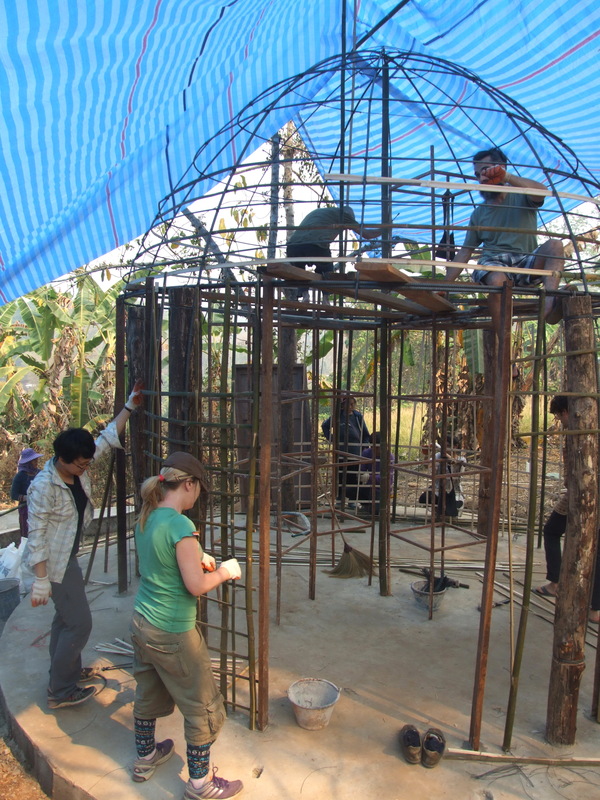 While a few intrepid people worked up on weaving the frame up in the dome, the others worked on the frame for the walls. Working on the frame to which the bags of rice husks will be attached. The ‘birdcage’ is finished, including the placement of windows and doors. Windows and doors are added at this stage. 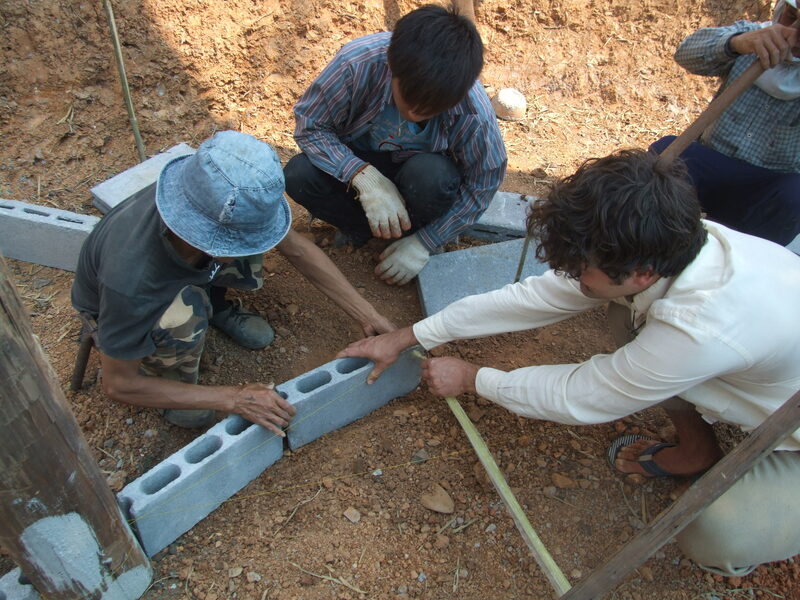 These can sometimes be quite tricky as the walls will eventually be about 30 cm thick. In the other domes the bags were added to the inside of the birdcage, so doors and windows were easily included in the main frame of the ‘birdcage’. In this dome, because I want to be able to see the wooden posts inside the room when it is finished, the bags are going to be added to the outside, meaning our doors and windows need to be 30 cm out from the frame. We make box like wooden frames, and embed the up-rights into the concrete floor. In the above picture you can see the first of the bags going in, and the up-rights of the wooden frame surrounding the window and door embedded into the concrete floor. A challenge for a participant: create a dog door! Participant Jules undertook the challenge of creating an opening for my various dogs and cats to come and go without me having to open the door for them, and without cutting into the lovely second hand doors that I bought for what will eventually become my bedroom dome. 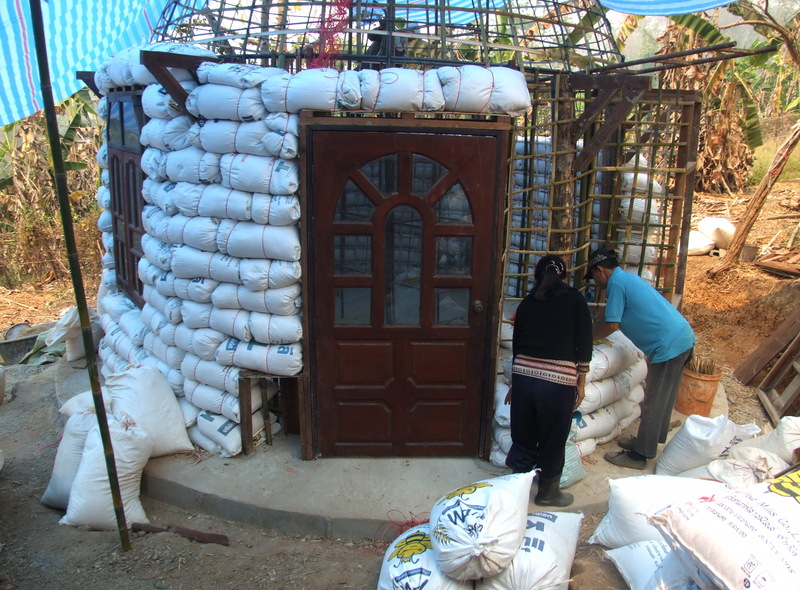 The bags of rice husks go up forming the walls of the dome. Mixing the plaster for the walls. 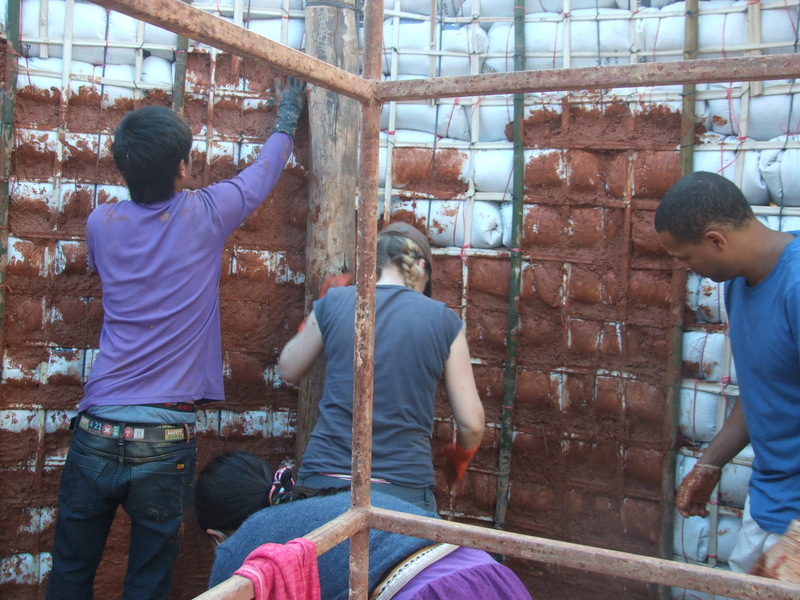 Once all the bags have been attached to the frame, the next step was to learn how to make the mix of mud, rice husks and sand which forms the base of the plaster for the walls. We add a little lime into this mix too, to make it stronger and insect resistant. When there are large gaps between the bags we use straw coated with our mixture to plug them. Now you can clearly see the dog door – which Lucy has just come out of! 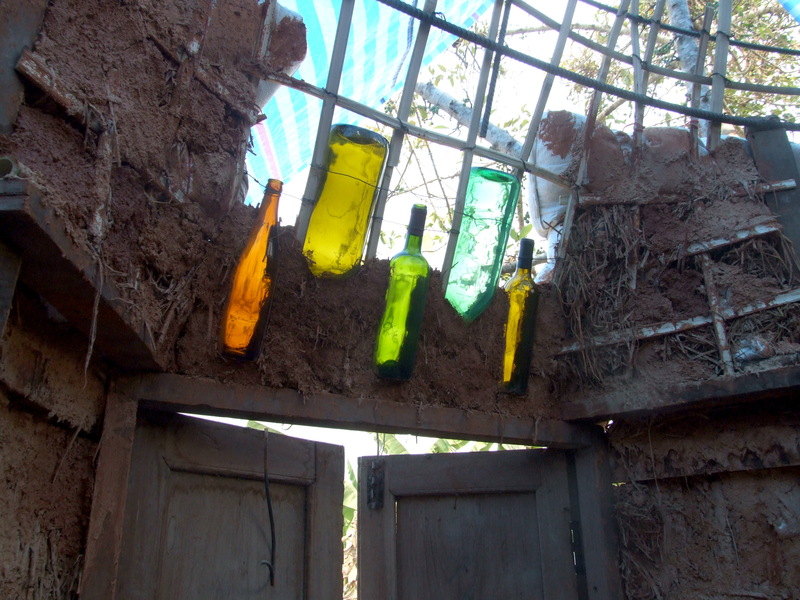 Another interesting feature being created by participant Mark: a glass design using bottles, above the door. The only limitation to additional artistic features is your imagination! 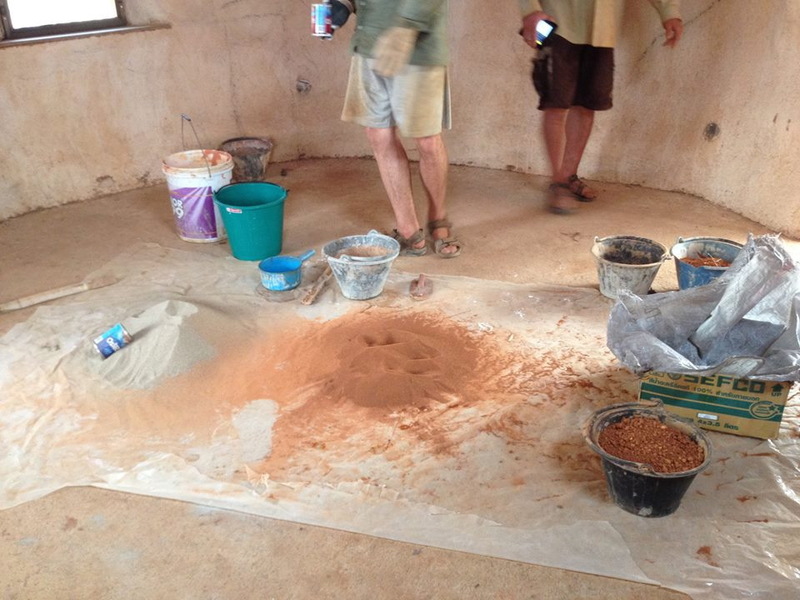 In order for the participants to experience mixing and applying a final fine lime plaster, we used the walls of another almost completed Roundhouse, which you can see below. A fine lime plaster for the final coat. This plaster is mostly lime, which has been sifted and soaked for a few days, and then finely sifted (though a mosquito net sieve). Then earth and sand is added for colour, and a dollop of sticky wheat paste (flour cooked in water). This is a very different experience to the application of the previous heavier plaster mix, which can be applied by hand. Now we need to use a trowel and focus on getting the plaster smooth. Attaching a shelf on to a wall. For more building experiences we went to another of the Roundhouses and learned to attach the frame for a shelf to a wall with bamboo stakes, and woven bamboo. This will be covered with plaster and will set very firm. I have lots of heavy books on my shelves! We then learned how to make an earthbag bench that will be covered with plaster. For more details on this and all the other processes, have a look back at past Blogs. This is as far as we got on our Roundhouse Dome during the short time of the workshop. 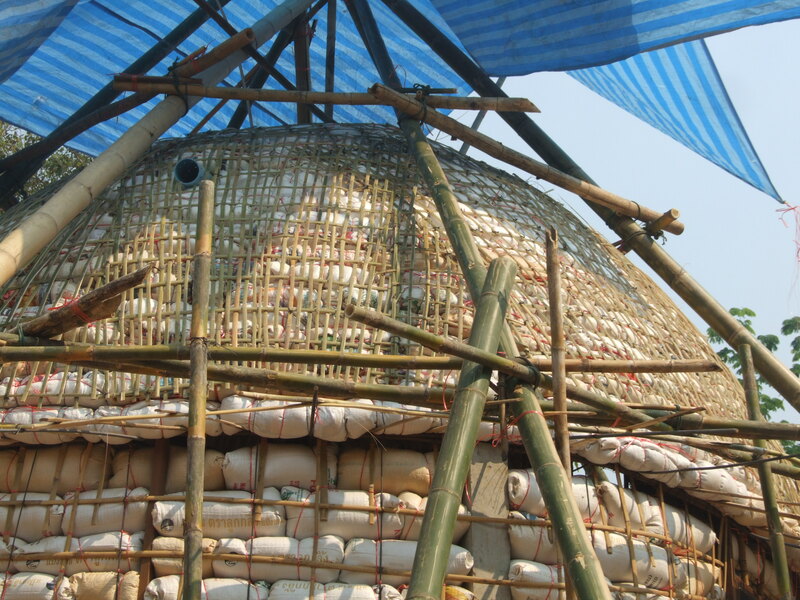 We did not continue to add the bags of rice husks to the frame of the dome, as we already knew how to do this and it would have taken a few days to complete the dome. We could not continue the plastering either until the plaster was properly dry. And so, as you have seen, we learned some other techniques to add to our store of knowledge and experience! Most of our wonderful group of participants and our Thai team. Every day of building was not just a great learning experience, it was fun. Now I know that I’m not a complete idiot with a saw, hammer or machete (actually smiling about that right now) and it has given me a lot of confidence in my building ability. Now I realise I can actually build something thanks to the hands on experience. Mark from Australia. Thanks so much for sharing your knowledge, time and passion for rice husk building, and your philosophy of building as art. It was a wonderful experience! Martin from the US, living in Indonesia. Wonderful news! The Second Rice Husk Bag Workshop will take place 3 – 13 November 2015!! This time we will be building a Women’s Community Centre in a village of Kachin refugees in northern Thailand (near Arunothai). Come and join us!! Tell your friends!! More information will appear soon on Chiang Dao Roundhouses website www.chiangdao-roundhouses.com Or contact Maggi maggimck@yahoo.com or through this Blog. Have you ever wanted to build your own home? Interested in eco building but don’t know much about it? 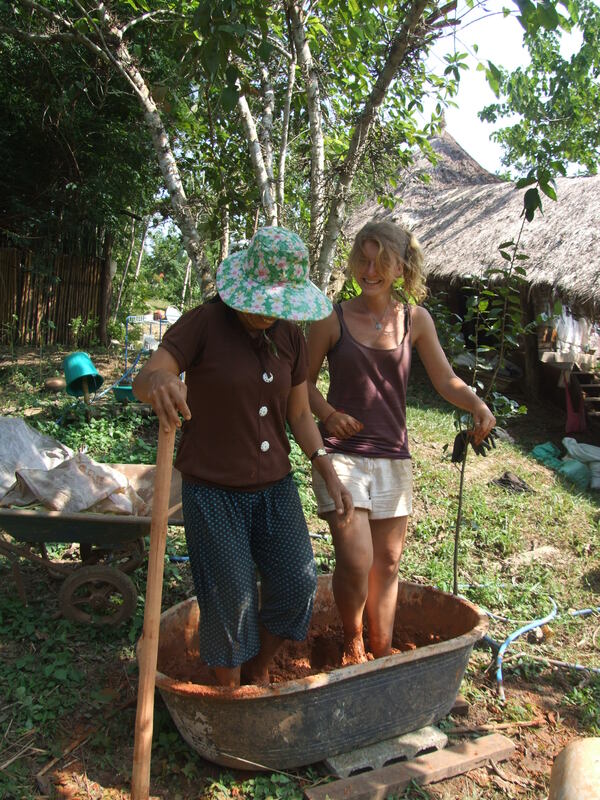 Fancy a holiday with a difference, getting your hands and feet dirty building with muddy earth? 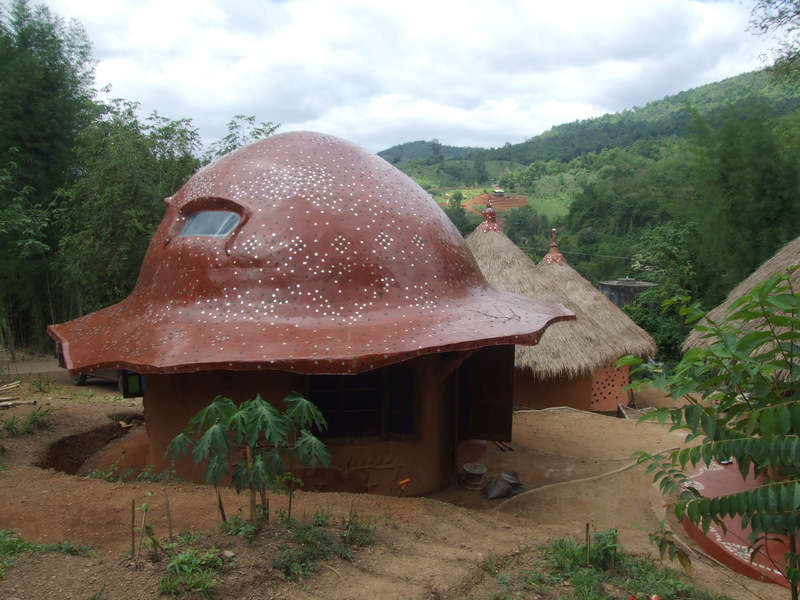 Come and join our workshop at Chiang Dao Roundhouses and find out exactly how these amazing roundhouses are made. Rice husks (hulls) and sand, lime and mud, bamboo and local materials combine together to make a roundhouse with a domed roof. 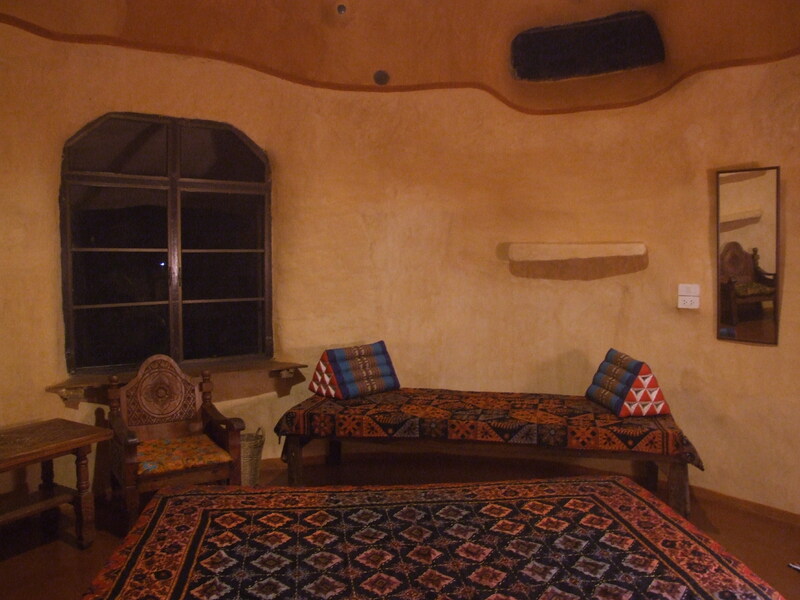 The thick walls will keep you cool in summer and warm in winter. 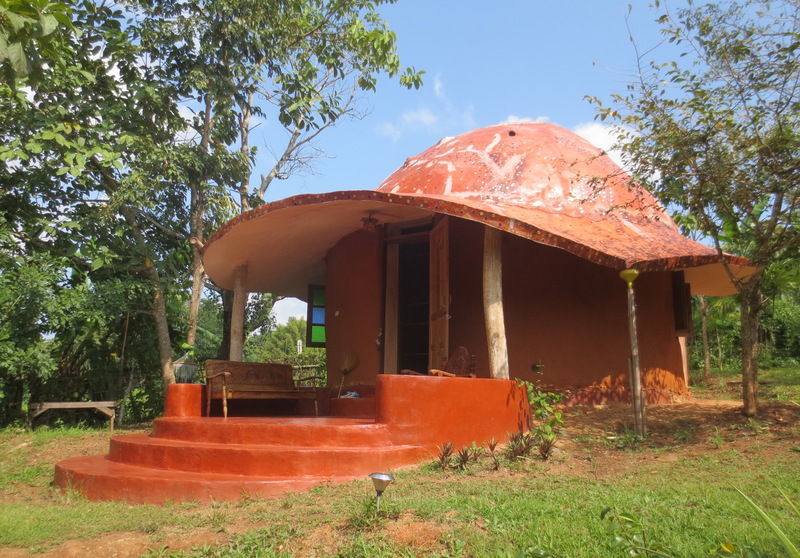 You may have heard of earthbag domes. Well, ours is a rice-husks-in-bags dome! I will be facilitating the workshop, after building and perfecting this method for the past 2 years, as you can see from all the previous Blogs. The workshop will start on 10th March (arrival of participants 9th March) and end on 20th March. Cost for the workshop will be I0,000 Baht. Accommodation (for 10 people only) will be available on site in Roundhouse dorms and meals are included for a further 2000 Baht. Other accommodation is available nearby in guest houses in the village. A non refundable deposit of 2000 Baht will reserve your place, and the balance is due by the end of February 2015. 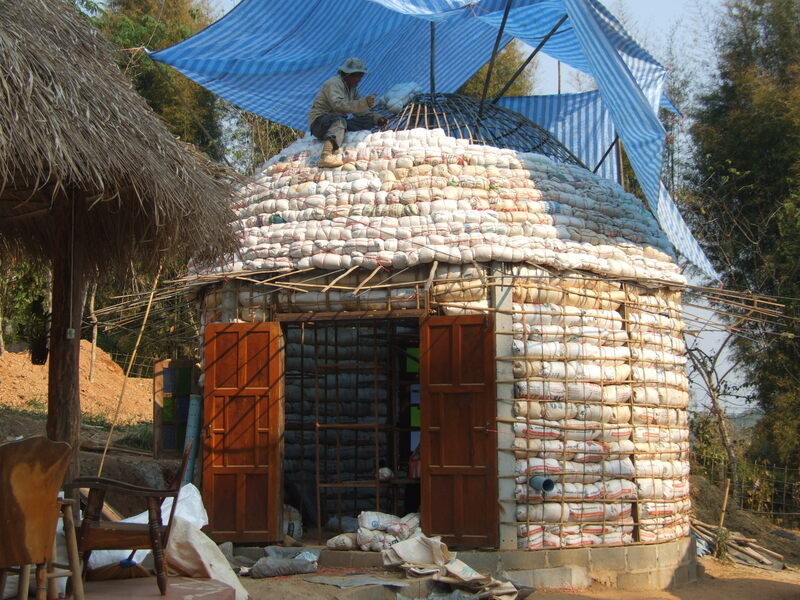 A Roundhouse made from bags of rice husks, earth, sand, bamboo and other local materials. This is something like the dome we are planning on building in the workshop. However, all buildings are different and develop their own personality as the building progresses. I wonder what the final building will look like? It is one of the exciting things about natural building, at least my natural buildings. No plans, just ideas, plus using all the experience I have had building the other 9 round buildings on the site. The foundation will be in place before you arrive for the workshop. I will show you, using photographs, exactly how it is made. This is the theory part of the workshop. This is the framework of bamboo and steel that I call a ‘birdcage’. 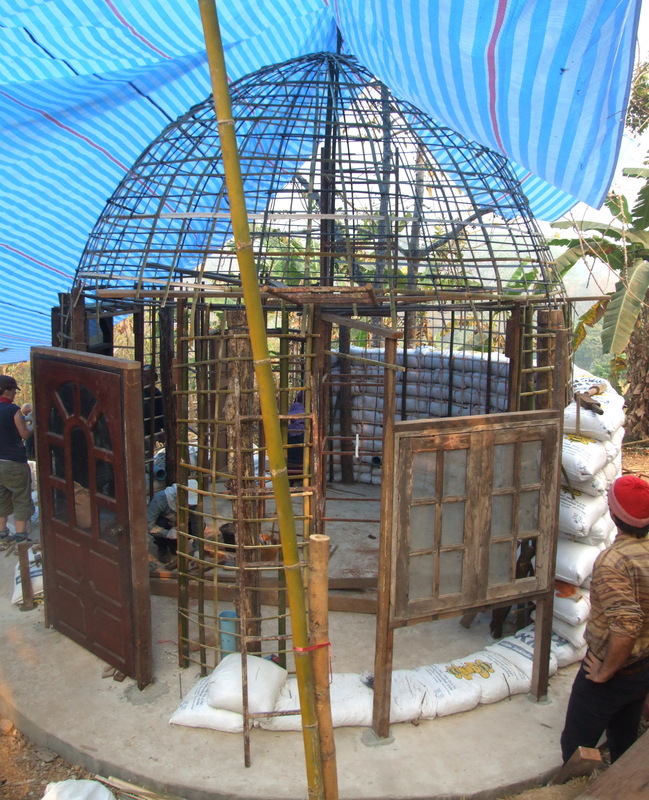 We will begin the practical by building a spectacular ‘birdcage’ using bamboo and steel, and adding in the windows and doors (all second hand teak wood). Next is to add the infill of bags of rice husks. This work goes very quickly as the bags are light weight. We will need to re-make some of the bags to go into the ceiling as these need to be smaller than the wall bags. 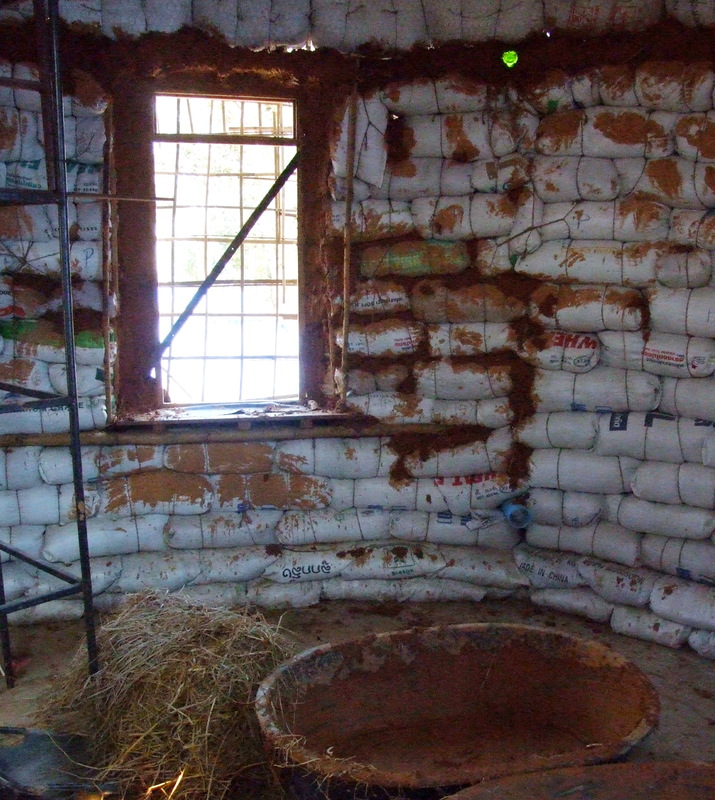 Bags filled with rice husks attached to the birdcage make up the walls. Smaller bags are attached to the domed roof. Now we get the chance to get muddy! Our plaster is a mix of mud, sand, rice husks and lime, and some straw. We need about four layers on the walls before the final finish of smooth and beautiful plaster. As we will not have time to let the coats on this building dry so that we can get to the final plaster, we will finish off one of the other buildings on site, so that you will have a chance to mix and apply different kinds of plaster. 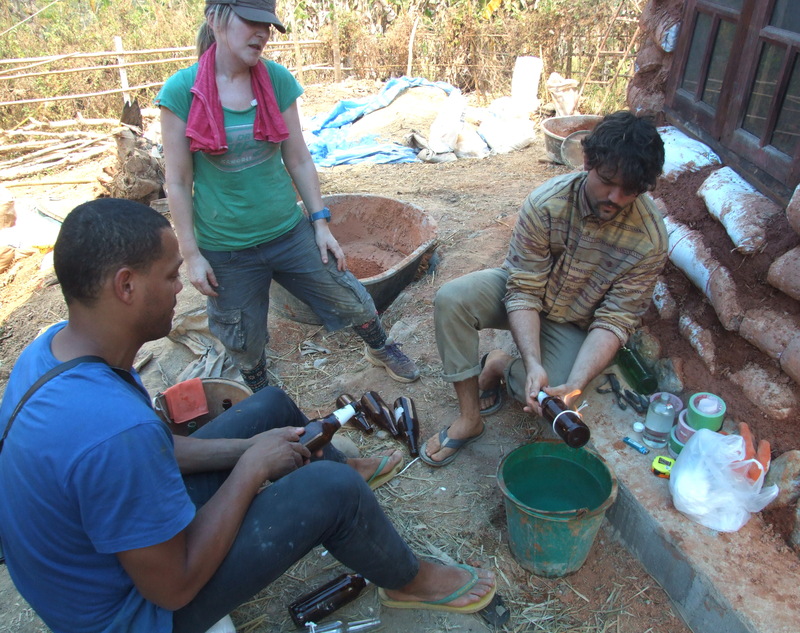 Mixing the mud plaster for the walls. Covering the bags with mud plaster. 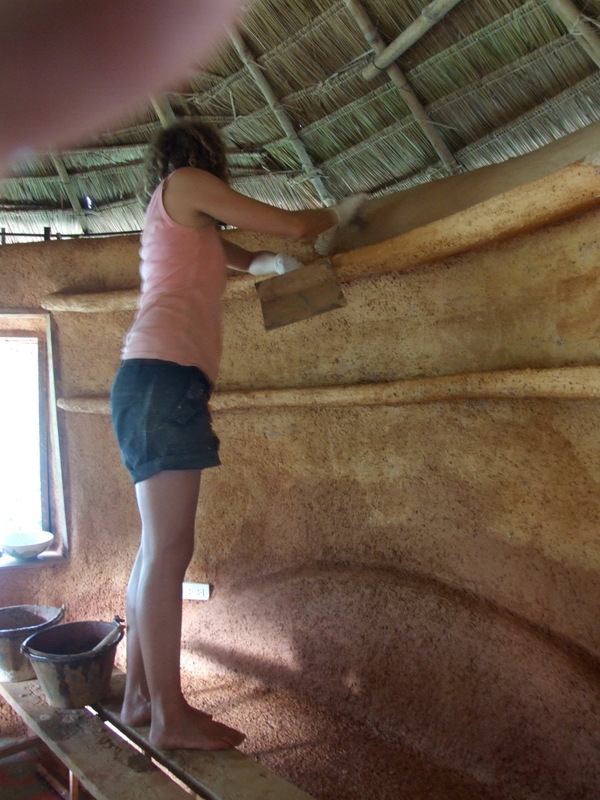 Applying the final layer of smooth plaster to inside walls. Applying the final layer of smooth plaster to inside walls. 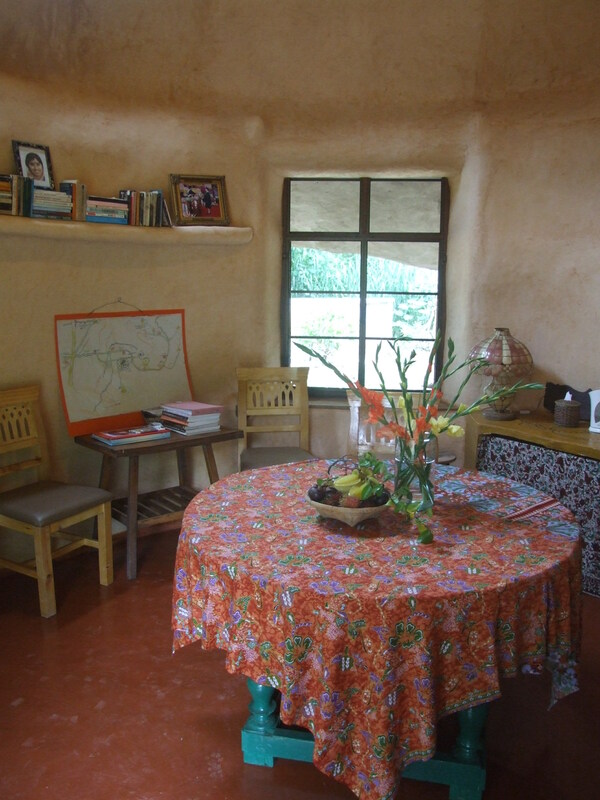 Note the shelves, made from woven bamboo covered with plaster, and the bench seat, which has an earthbag base. In 10 days we will also not have time to put up the roof. I am intending to try a new method of split bamboo tiles for this roof. We will spend some time discussing (with photographs) different types of roofing and may even work out some completely new ideas! A ‘finished’ roundhouse – not that they are ever completely finished as long as one has imagination, mud to paint, straw to sculpt and more and more ideas….. Inside the Roundhouses, Chiang Dao Roundhouses B&B. 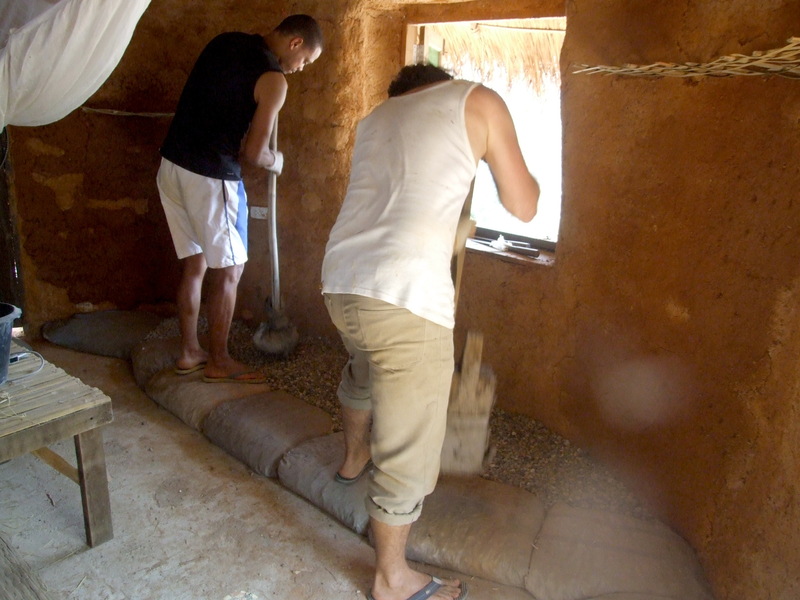 The first step for the interiors of the roundhouses was to cover the bags of rice husks with several layers of mud, sand and rice husks mixed with some water into a paste. Large gaps between the bags have straw added to the mixture. Applying the first layer of rough plaster. After several layers were applied, and the shape of the walls defined, we were ready for the final smooth layer of plaster. We experimented with various plasters and finishes. We decided to use lime as an ingredient for all finishes as it is a good protector from both water and insects. Although it is not water-proof, it is water resistant, meaning that it can take a certain amount of water without disintegrating. For the interiors this is ideal. Sand and earth sifted through wire mosquito net ready to mix into a wall plaster. Added to the lime is earth and sand. Both are sifted through wire mosquito netting, which has very fine holes. 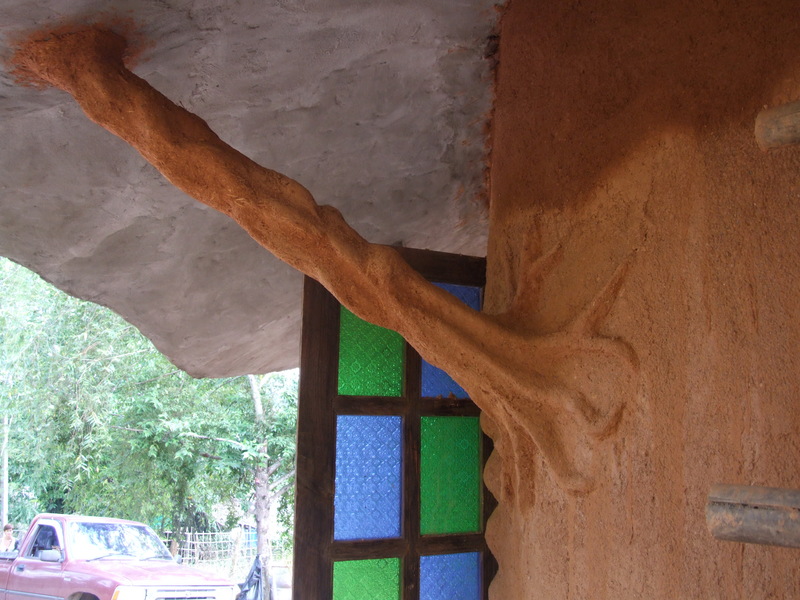 We knew from our experience with the rough plaster of the first few layers that the earth needed double the amount of sand added to it to form a good finish, so that it would dry without too many cracks. The dry lime powder was also sifted through the mosquito net sieve, and then soaked for a few days in water. Apparently the longer you can soak the lime the better, but we found with ordinary Thai lime that a few days was sufficient to get rid of all the tiny lumps that can make the plaster look spotted when dry. Next we experimented with proportions of lime to the earth and sand, to find the colour that we liked. We also tried different colours of earth, and a number of combinations of everything. Working out the proportions of ingredients to find the colours we liked. Once the samples had dried we made our decisions. Small batches were mixed in buckets, and a large spoonful of flour cooked with water to make a paste was added to each bucket of mix. Finally, the mix was spread on to the wall. First water was sprinkled on to the wall to help the plaster to stick well. Then the mixture was spread either with hands, or different kinds of spatulas. Again, we experimented to find what was best. It took a while for us to work out how to spread the plaster so that it would dry with the least amount of cracking, and also to match it in colour from batch to batch. We found that different people had different results, and so some of the domes look as if they have different types of plaster. 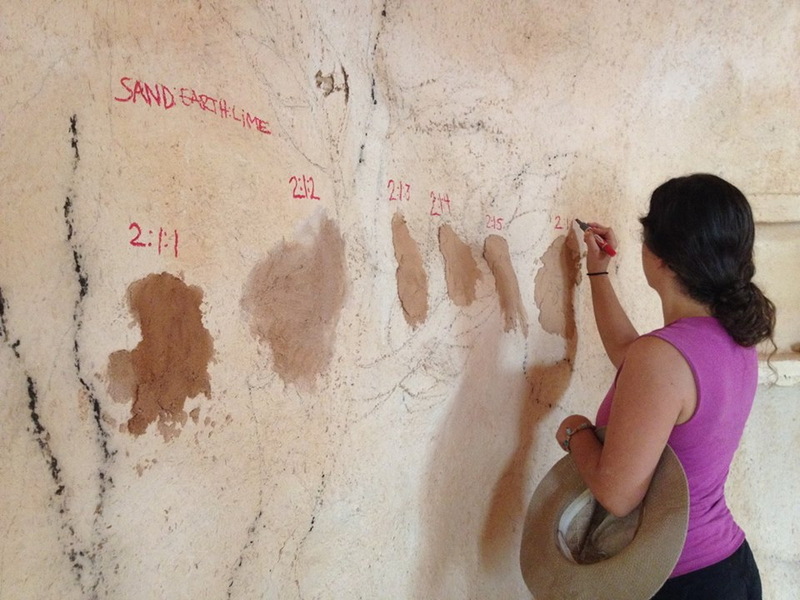 Two different coloured plasters for the upper dome and walls of this roundhouse, separated by a band of mud paint. Beautiful smooth final plaster on the Breakfast Dome wall. 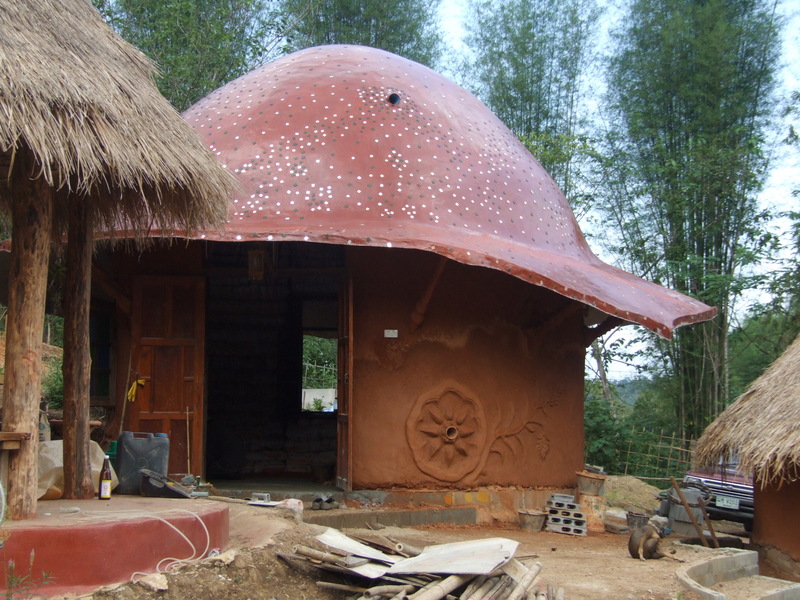 The final roundhouse, the Breakfast Dome, was the most successful plaster finish made by two of our Thai team who had by that time become experts, and the finish was beautiful and smooth with next to no cracking. 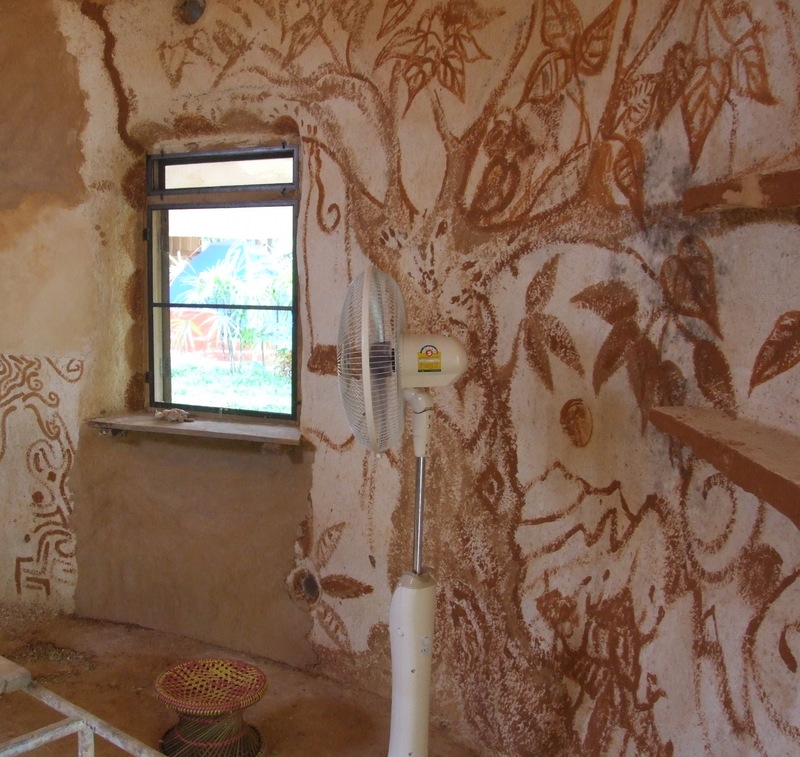 On one of the domes we decided to experiment with making some murals from mud paint, different earth giving us different colours. However, with five people painting in five different styles it all looked too much and we decided to cover the walls with a plain plaster after all. But in the future we may take up this idea again, perhaps one person only decorating a small amount of wall. Or we could add a plain lime wash and make the whole dome white inside; or apply a mosaic; or we could try different ideas at different times! Actually the limit is only the limit to imagination, so watch this space for future wall art! An experiment in wall art using mud paint. Our second-hand teak doors and windows and old furniture have also been sanded down and polished with some kind of oil which is used locally and looks good, and seems to protect the wood well. I have not yet been able to find out what kind of oil it is! We made some beds out of second-hand wood and covered the wood frame with bamboo. They look really good! 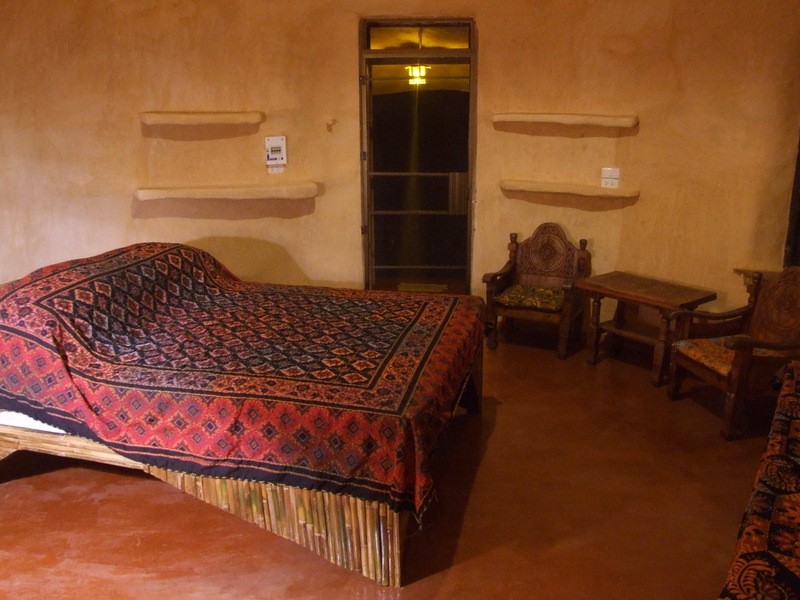 Note the bamboo bed, old teakwood furniture and lovely warm plastered walls. 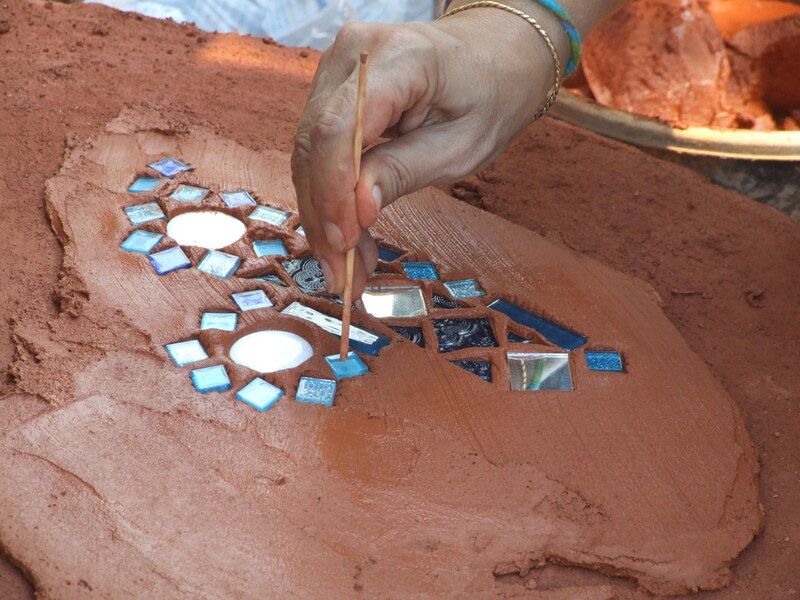 The floors are cement mixed with sand and various pigments, mostly red oxide, to give a warm glow, and mosaics of broken tiles and small stones have been made on steps and in bathrooms. We can always add more in the future. These buildings are living, breathing (through the rice husks and mud walls) and changing over time! As the bathrooms are partially open air, there wasn’t much interior to work on. The glass bottle wall is cement block as it is open to the monsoon weather. 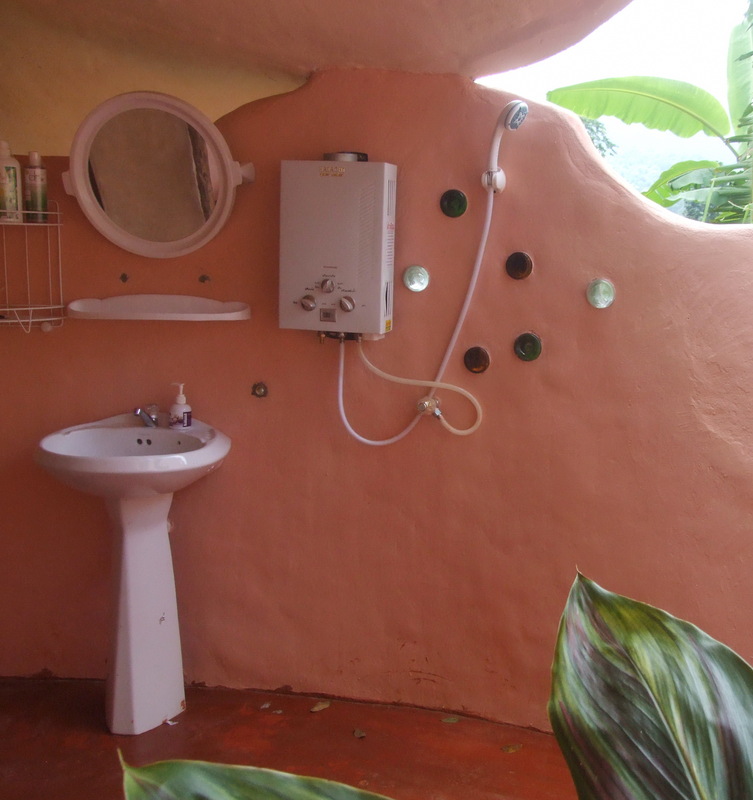 Glass bottles decorate the wall of this partially open-air bathroom. 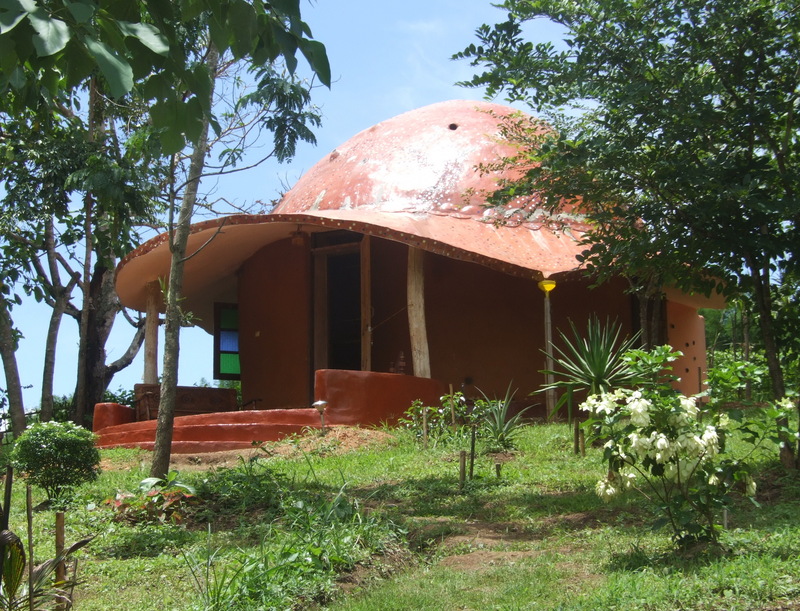 We plan to hold a workshop in the new year, end of February 2015, for people who would like to learn how to build one of our unique rice-husk-bag and earth domes. The workshop will last about 10 days and will be limited to 10 people. If you are interested and would like more details, email me at maggimck@yahoo.com. This is what we will be building in the workshop February 2015. 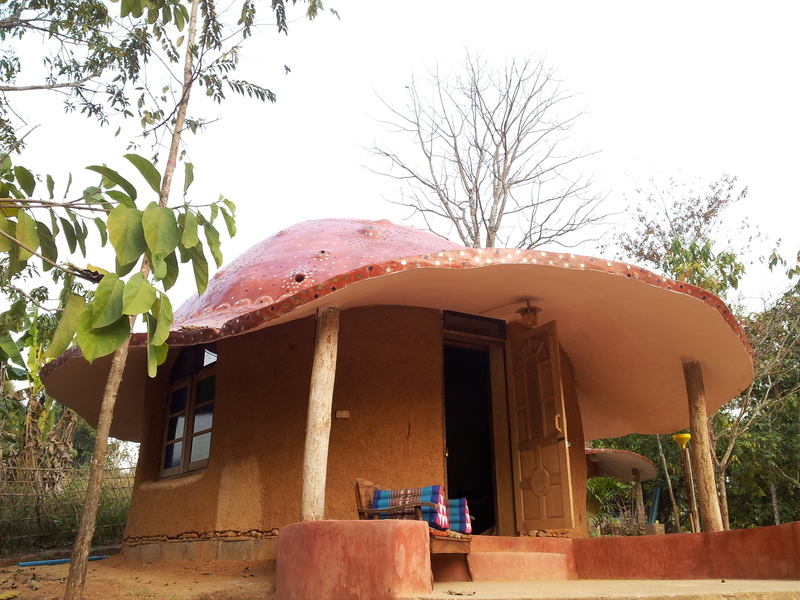 It is also your accommodation at Chiang Dao Roundhouses B&B. And the best news of all: the B&B is OPEN for business! Come and stay! The ‘Breakfast’ Dome went up in the same way as the other domes (see previous Blogs) except for one innovation. We decided to put the rice husk ‘sausage’ shaped bags that line the domed roof on the outside of the frame instead of the inside. Everything went much quicker and the dome was lined in 4 days. 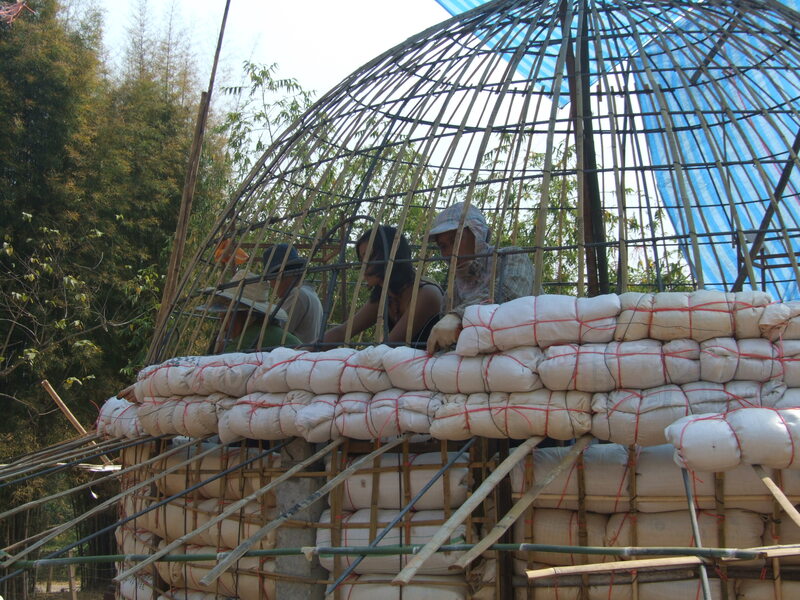 Thai team and volunteers attach the ‘sausage’ shaped rice husk bags of the domed ceiling onto the outside of the frame. Attaching the bags to the outside made the process much quicker. Next step was to weave a covering of bamboo over the bags so that the cement cap would have something to grip on to. Cement covered the bamboo cap. This is necessary because of the monsoon rains. 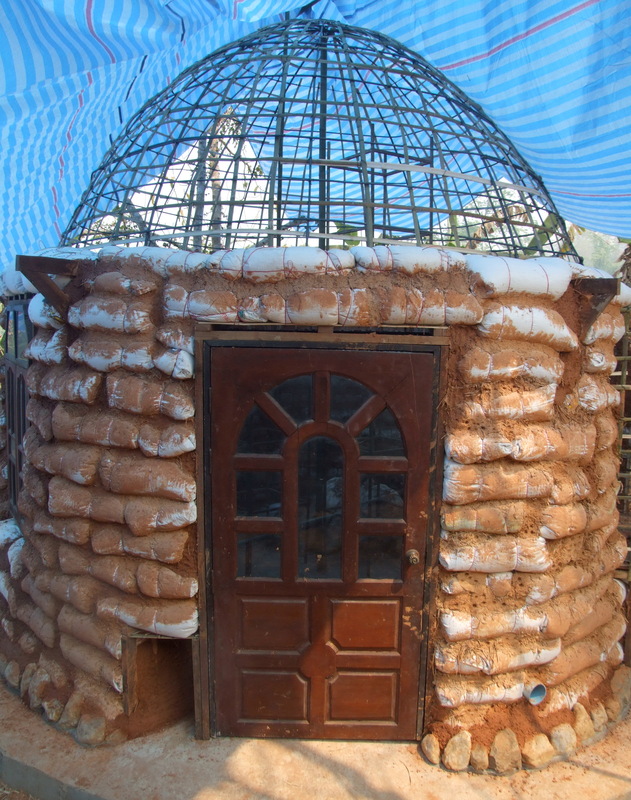 The top bit of the dome was finished before we began to build the overhanging eaves, which were woven bamboo and steel rebar, with plywood underneath to hold up a layer of cement. 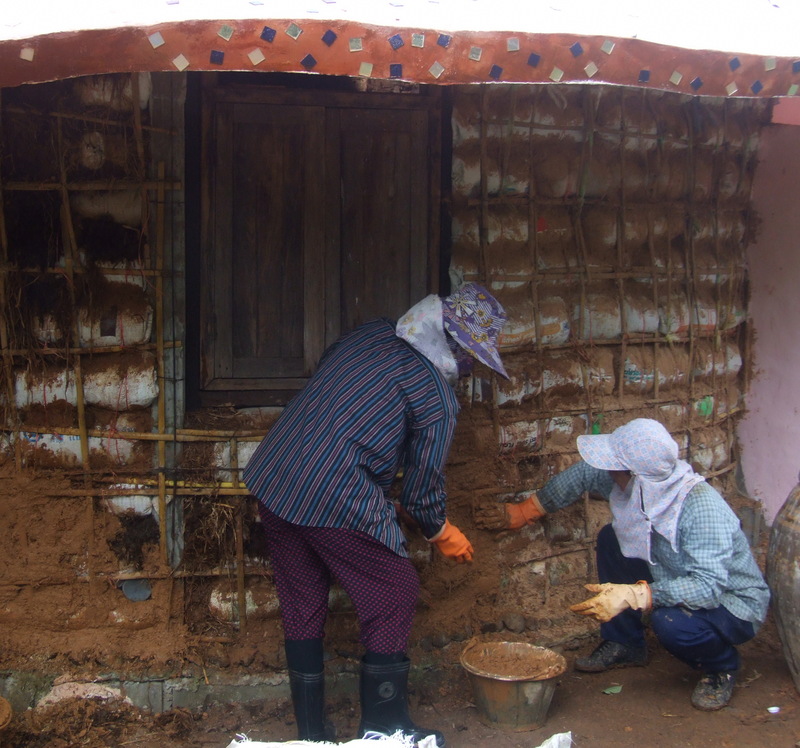 Building the eaves to protect the mud plaster of the walls. The eaves are finished and mud is on the walls. We are now much better at applying mud to walls and so able to be a bit more imaginative. One of the Thai team did this design. 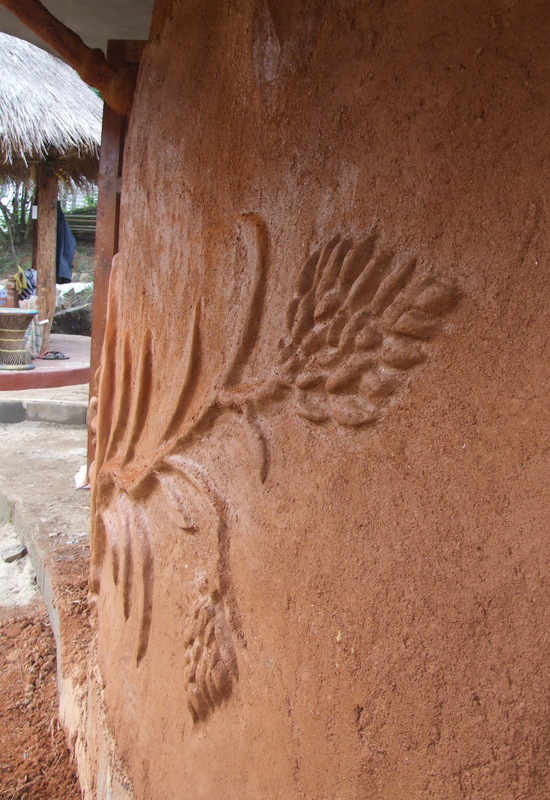 Each of the wooden eaves is covered with mud and straw and then a unique design made on each one – done by different volunteers. This eave looks as if it has grown into place. The outside of the Breakfast Dome is pretty much finished and looks great in line with the two roundhouses below, with their top-knots matching the mosaic on the dome. Three roundhouses in a row. Meanwhile, volunteers are working at plastering the inside of one of the domes, which will be one of the bedroom domes, and it is beginning to look fabulous! Final smooth plaster goes on inside a dome. The rains have finally begun! View from my porch on a stormy afternoon. It was very hot during the last couple of weeks before the monsoon began, and we are all thankful and happy that the weather is cooler. Practically over night plants began sprouting and new leaves are now covering the trees. I am looking forward to learning more about gardening and am hoping for some experienced gardening volunteers to show up and teach me!